Paul in 40-Year-Old Virgin. . Wallpaper and background images in the Paul Rudd club tagged: paul rudd 40 year old virgin judd apatow steve carrell seth rogen. 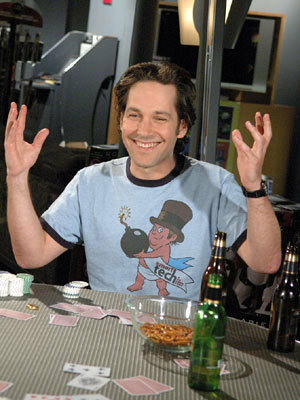 This Paul Rudd photo might contain tavolo da pranzo, cena, birreria, and brasserie.